SCHREBER'S CAT OF MANY COLOURS. 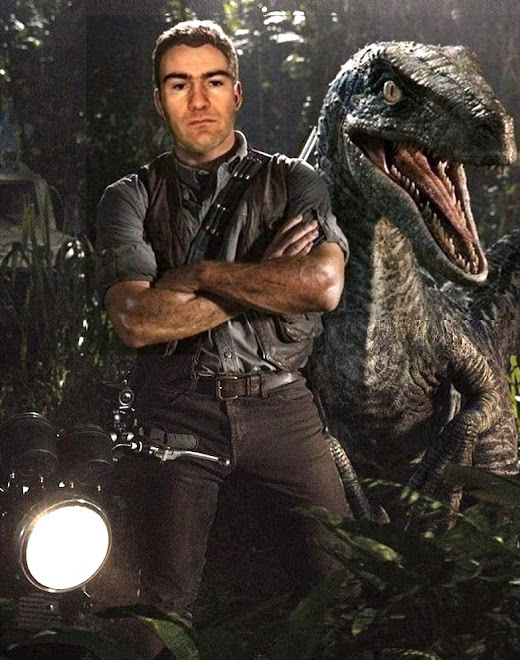 In zoological parlance, a morph is defined as one of two or more physically (but not taxonomically) different forms of individual exhibited by a given species. For example, the black panther is a melanistic morph of the leopard Panthera pardus. Having said that, some morphs of certain feline species appear so different from one another on first sight that in days gone by they were rigorously classified as wholly distinct species in their own right. The serval and the servaline are a case in point. Formally christened Leptailurus [=Felis] serval in 1776 by Carl Schreber, the serval is a distinctive species of medium-sized African wild cat with noticeably big ears, long limbs, and a tawny-yellow coat handsomely marked with large black blotches and polka dots. Native to much of tropical Africa except for the closed rainforests of Central and West Africa, it is most commonly encountered in open country, particularly dry savannahs and steppe. 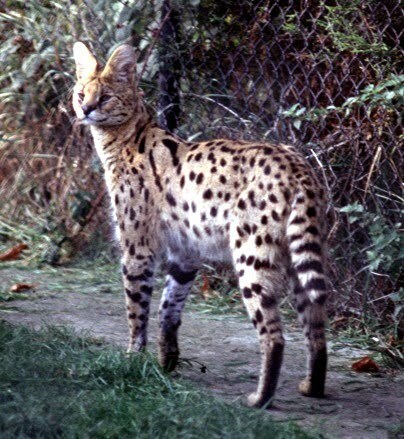 In 1839, however, English zoologist W. Ogilby documented what he considered to be a second, totally discrete species of serval, native to the moist savannah zone encircling the jungles of Sierra Leone, Guinea, and elsewhere in western Africa. He named it Felis servalina, and it thus became known as the servaline and also, very appropriately, as the small-spotted serval. Eschewing the serval's large blotches and polka dots, the servaline's coat was flecked with a dusting of only the finest, tiniest dots, so that when viewed from any distance the animal seemed to be almost uniform in colour, without any evident patterning. In later years, the servaline's taxonomic status became a perennial topic for dispute within scientific circles. Some figures, such as Professors Bocage and St George Mivart, and Richard Lydekker (all respected zoological authorities in the 1800s), as well as the eminent 20th Century United States mammalogist Dr J.A. Allen, were convinced of its separate standing. According to Allen, a series of serval and servaline pelts collected in what is now the Democratic Congo and housed at the American Museum of Natural History could be readily sorted into two discrete types - large-spotted (servals) and small-flecked (servalines) - with no intermediates. There were other experts, conversely, such as Drs D.G. Elliot and Philip L. Sclater (a onetime Secretary of the Zoological Society of London), who adamantly refused to accept the servaline as a legitimate species - and were ultimately vindicated for their scepticism. In 1915, a tribesman from Sierra Leone brought to attention two kittens, one a serval and the other a servaline, that he claimed were from the same litter - but as his claim was not substantiated by independent testimony, Allen would not accept it as scientific evidence. Some years later, however, Colonel C.R.S. Pitman, a Ugandan game warden with a longstanding interest in mysterious, controversial African animals, examined a sizeable collection of serval and servaline pelts while conducting a faunal survey in Northern Rhodesia (now Zambia), and was startled to find that they could be arranged in a sequence that produced a continuous intergradation of coat patterns conclusively linking the serval and servaline to one another. In other words, the 'serval' and the 'servaline' were nothing more than names for the opposite ends of a spectrum of coat patterns exhibited by a single species. Pitman duly sent a selection of these significant pelts to London's Natural History Museum, and the servaline accordingly vanished from the list of feline species accepted by modern-day science. Intriguingly, exotic jet-black servals are often sighted in mountainous localities, including the Aberdares in Kenya and Mount Kilimanjaro - truly a cat of many colours! WHEN GOLD TURNS TO SILVER - LITERALLY! With handsome golden-brown fur, the African golden cat Profelis [=Felis] aurata, seen here, was one of two closely related but ostensibly separate species of cat named from this continent in 1827 by Dutch zoologist Professor C.J. Temminck. The second was the silver cat F. celidogaster (also known as the grey cat). Both were initially known only from western Africa, but specimens were later encountered in eastern Africa too. To make matters even more complex, western specimens of both species were often heavily marked with spots (earning them, somewhat incongruously, the alternative name of tiger cat), whereas eastern specimens of both species were generally plain. As with the serval and servaline, zoological opinion during the 19th Century concerning whether or not the golden cat and silver cat were taxonomically distinct from one another was split - until the truth was finally exposed in a singularly memorable manner at London Zoo. In June 1906, a golden cat arrived at the zoo sporting its species' typical foxy-rufous coat colour - only to moult its fur during the next four months and replace it with the steely-coloured pelt characterising the silver cat! Thus ended the taxonomic tribulations surrounding another dimorphic denizen of the Dark Continent. 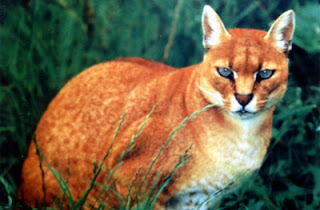 Not to be outdone, however, for a long time the African golden cat's Asian relative, nowadays known as Temminck's golden cat Felis [=Catopuma] temminckii, posed an even trickier dilemma for science. The intricate coat markings of one of its subspecies, a large Burmese and Tibetan version known as Fontainier's cat F. t. tristis, are deceptively similar to those of a totally separate species, the leopard cat Felis [=Prionailurus] bengalensis - so much so that some zoologists were once in favour of classifying Fontainier's cat as a leopard cat subspecies instead! And in South America, the red morph of the grey-furred jaguarundi Felis [=Puma] yagouaroundi was initially deemed to be a valid species, termed the eyra F. eyra. Never judge a book by its cover - or a cat by its coat, it would seem! 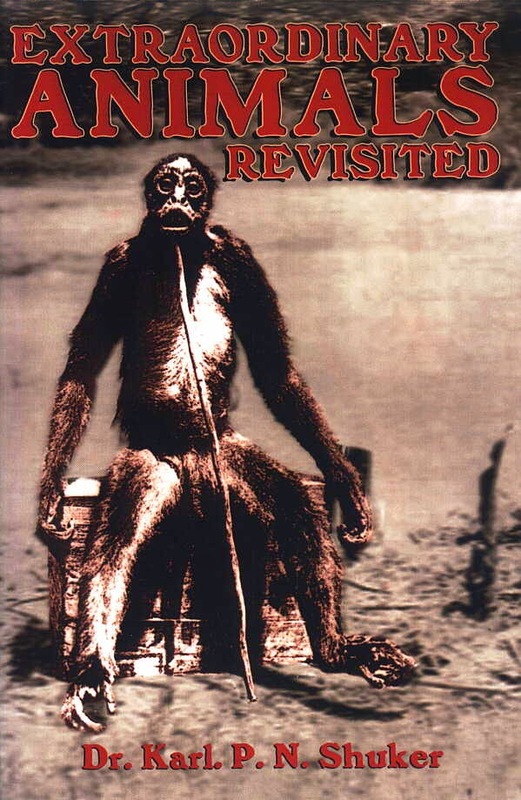 My book Extraordinary Animals Revisited (CFZ Press, 2007) closed with my waxing lyrical over Molly, the singing oyster – hitherto a tragically-overlooked and under-listened-to marvel of the deep. At that time, I had assumed that she was unique, a singular songstress whose like had never been known before or would be again. How wrong I was! "On the occasion of a visit which I made to Batticaloa [in the northern forests of Ceylon, now Sri Lanka], in September 1848, I made inquiries relative to a story which had reached me of musical sounds, said to be often heard issuing from the bottom of the lake, at several places, both above and below the ferry opposite the old Dutch Fort; and which the natives suppose to proceed from some fish peculiar to the locality. "In the evening when the moon rose, I took a boat and accompanied the fishermen to the spot. We rowed about two hundred yards north-east of the jetty by the fort gate; there was not a breath of wind, nor a ripple except those caused by the dip of our oars. On coming to the point mentioned, I distinctly heard the sounds in question. They came up from the water like the gentle thrills of a musical chord, or the faint vibrations of a wine-glass when its rim is rubbed by a moistened finger. It was not one sustained note, but a multitude of tiny sounds, each clear and distinct in itself; the sweetest treble mingling with the lowest bass. On applying the ear to the woodwork of the boat, the vibration was greatly increased in volume. The sounds varied considerably at different points, as we moved across the lake, as if the number of the animals from which they proceeded was greatest in particular spots; and occasionally we rowed out of hearing of them altogether, until on returning to the original locality the sounds were at once renewed. "This fact seems to indicate that the causes of the sounds, whatever they may be, are stationary at several points; and this agrees with the statement of the natives, that they are produced by mollusca, and not by fish. They came evidently and sensibly from the depth of the lake, and there was nothing in the surrounding circumstances to support the conjecture that they could be the reverberation of noises made by insects on the shore, conveyed along the surface of the water; for they were loudest and most distinct at points where the nature of the land, and the intervention of the fort and its buildings, forbade the possibility of this kind of conduction. Sounds somewhat similar have been heard under water at some places on the western coast of India, especially in the harbour of Bombay. At Caldera, in Chili [=Chile], musical cadences are stated to issue from the sea near the landing-place; they are described as rising and falling fully four notes, resembling the tones of harp strings, and mingling like those at Batticaloa, till they produce a musical discord of great delicacy and sweetness." Intriguingly, after Sir Emerson Tennent communicated his observations at Batticaloa to the Edinburgh Philosophical Society, one of the scientists present, a Dr Grant, experimented with some specimens of a mollusc (Tritonia) by placing them in a glass vessel filled with sea-water. This vessel was placed on the central table of the Wernerian Natural History Society of Edinburgh, around which many members were sitting. During the whole time of the meeting, a “clink,” as of a steel wire struck on the side of the jar, was heard at intervals, and so distinctly that it extended to the distance of twelve feet. 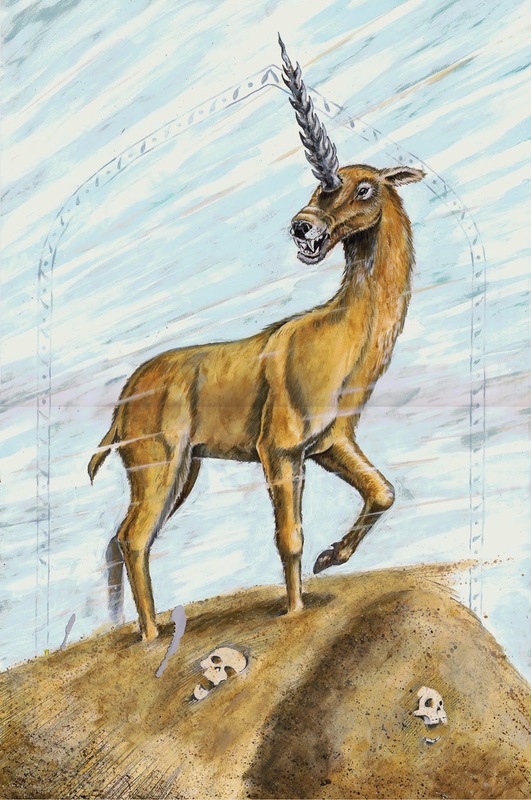 THE SINISTER SHADHAHVAR - PERSIA'S UNICORN SIREN OF THE SANDS. And now, as they often said on 'Monty Python's Flying Circus', for something completely different. Some of you may know that I have been working for quite a time on a companion volume to my bestselling dragons book, Dragons: A Natural History (1995). This time, however, the subject is not the dragon, but the unicorn, surveying its surprisingly numerous varieties and retelling some of its most famous, and also certain much less familiar, legends and folktales. Now, here for the very first time anywhere, I am presenting as a CFZ world-exclusive an excerpt from my unicorns book, unveiling the deadly Persian shadhahvar. I hope you enjoy it. PERSIA'S UNICORN SIREN OF THE SANDS. An excerpt From Chapter 2 of my in-progress book Unicorns: A Natural History. He had been lost for days in the featureless, seemingly endless Persian desert, with scarcely any food or water left, so it would be little wonder if he were indeed beginning to hallucinate. How else could the lone traveller, roaming far from his European homeland, explain what he was now hearing? From nowhere, the hot desert air had suddenly filled with the strains of glorious music, as if the very wind itself were a celestial flautist, piping dulcet melodies that caressed and calmed, lured and lulled, sang and soothed, as the weary traveller stumbled onwards. They reminded him of the zephyr-murmured refrains that would drift from the Aeolian harps in his boyhood village. Yet the rapturous harmonies that now encompassed him were infinitely sweeter and stronger - and more mysterious. Then, abruptly, the traveller saw something that dispelled even the enigma of this phantom sonata far from his mind - for just ahead, its neck bowed down gracefully as it drank from a clear, sparkling pool of water in a small oasis, stood an extraordinary creature. 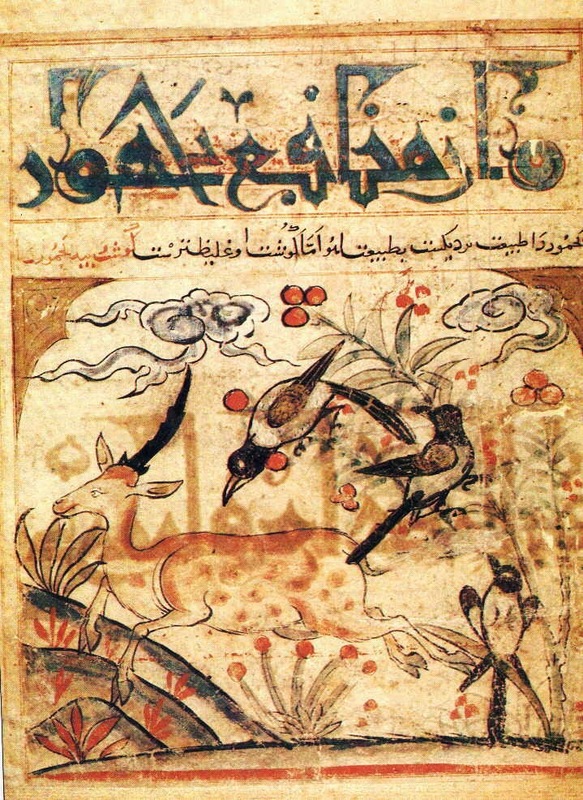 In general outline, it resembled a deer, but as he watched, the creature raised its head and looked at him - and to the traveller's amazement, he realised that it was a unicorn! There, set like a precious stone in the centre of its brow, was a long slender horn! As he looked closer, however, the traveller saw that it was no ordinary horn, and no ordinary unicorn - if such a magical beast as a unicorn could ever be called ordinary. Long ago, he had once briefly spied a unicorn in the forests near his home - a creamy-white steed with a shimmering, spiralled horn upon which shafts of sunlight danced like a bright animate rainbow. In contrast, the creature standing before him now was pale brown, matching the sandy hue of the undulating dunes on every side, was deer-like rather than horse-like, and its horn was even more marvellous than that of the unicorn he had previously seen. Eschewing the typical undivided horn of Western unicorns, it bore no less than 42 slender hollow branches, radiating upwards on every side, silver in colour and each perforated with tiny holes. And it was the blustery desert wind blowing through this incredible structure that was engendering the miraculous melodies still surging all around him! Here, more tangible but also more unearthly than any mirage, was a veritable siren of the sands - in the form of an exotic neo-unicorn! Thoroughly enchanted by these hypnotic sounds and by the majestic sight of the uncanny desert unicorn, the traveller moved closer, desperately anxious to learn more about this ethereal beast. And as he did so, the symphony emerging from its horn grew even louder, its sonorous music filling his brain with such wonderful visions that he was deafened and blinded to all thoughts of caution and possible danger. In any case, what danger could there be from this captivating creature, which gazed at him so innocently, willing him to draw closer, as it stood unafraid. Soon he was standing before the appealing, passive beast, and as its seductive harmonies swirled around his head he was close enough to see how fine the holes were that percolated the unicorn's horn, and how incredibly sharp the point of every branch was that diverged from the horn's central column. Falling to his knees in awe, how blessed the traveller felt, to have encountered such a glorious entity, and to have listened to its heavenly rhapsodies. Now he knew how sailors must have felt who had encountered the bewitching lorelei singing from her rock above the River Rhine, or the sweet-voiced original sirens - half-woman, half-bird - of ancient Greece. But even as he smiled in rapt delight at such thoughts, up from the depths of his unconscious mind, straining to be heard above the enveloping refrains of the unicorn's music, came a single tremor of alarm, a solitary dissonant note momentarily stilling the mellifluous harmonies that by now had all but smothered his conscious mind. Beware! Remember what happened to those lulled by the lorelei's alluring song and the dulcet strains of the sirens! Death! Theirs is the mesmerising music of Death! Shocked out of his melody-drugged reverie, the traveller's head jerked up, and his eyes met those of the desert unicorn - or shadhahvar, as it is known in this land. But instead of seeing the soft, loving eyes of the magical creature that he had spied in the forest back home all those years ago, he found himself staring into a pair of fiery pits in which the acrid scarlet flames of evil danced and laughed at his horrified gaze. He drew back, and saw a hideous, mocking leer flit briefly across the lips of the shadhahvar as they rolled back to reveal a series of savage predatory fangs. The traveller screamed in fear - but it was too late. Even as he backed away further, stumbling in his terror, the shadhahvar lowered its head, lunged forward - and impaled the hapless traveller upon its deadly horn, its many branches spearing every portion of his body. After a few moments, it shook its head violently, the gored bloodstained body of the dead man fell off its horn onto the sand, and the hungry shadhahvar rapidly devoured his corpse, tearing it to shreds with its long sharp fangs. Eventually, the shadhahvar moved away, ready to seek out a new victim elsewhere, leaving behind only a whitened human skeleton to be swiftly buried by the ever-shifting desert sands. Nothing remained as testimony of the terrible event that had lately transpired here - nothing except a single spot of blood, which spread out over a patch of sand like the petals of a crimson rose. But who has ever encountered a rose in the desert - that would be as unlikely as a siren of the sands...wouldn't it? The pictures here are by the immensely talented Bill Rebsamen. Prior to the famous if controversial film of an alleged bigfoot striding into a forest at Bluff Creek, California, which was taken on 20 October 1967 by rancher Roger Patterson, few people outside America had ever heard of this mystifying cryptozoological entity. In reality, however, stories supporting its existence date back centuries, as revealed by the following selection of bigfoot-related tales from the traditional folklore of the early European settlers and native American Indians. According to the settlers inhabiting Coos County in New Hampshire, the deep woodlands of this New England state harboured elusive, fleet-footed beings known as wood devils. 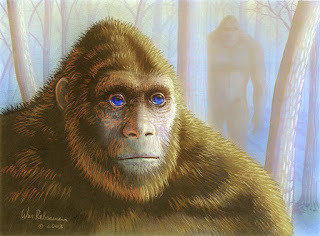 Although superficially humanoid in appearance, they were very tall, hairy, and thin, with grey skin. They were able to emit piercing screams, and their faces were not those of humans at all. Occasionally, a human would unexpectedly encounter one of these mysterious man-beasts, but if a wood devil became aware of a human's approach, it would conceal itself by standing upright and perfectly still against a tree, moving slightly to one side if necessary in order to keep the tree's trunk between itself and the oncoming person. All of these details are consistent with modern-day reports of the bigfoot. Even as far north as Alaska, traditional belief in bigfoot-like entities is strong. The Yupik Eskimos, for instance, still speak of the arulataq - whose name translates as a creature that makes a bellowing cry. The Yupik affirm that the arulataq is an exceedingly tall, hairy, man-like being, loftier than a 9-ft or even 10-ft-tall spruce tree, but with such lengthy arms that even when standing upright it could touch the ground next to its large feet with its hands. Similarly, current reports of the bigfoot often state that it has unusually long arms. Although the arulataq is not predatory and actually seems quite curious about humans (again like the bigfoot), people seeing one would run away in fear, because of its formidable appearance. A more common image in traditional American folklore, however, is that of the shaggy-furred, man-eating giant. According to an early Pueblo tale from Taos County, New Mexico, an old man once encountered one of these terrifying creatures, which killed him and took his body away to its cave. When he did not return home that evening, his family and friends set out in a party to search for him. After spying the hairy giant's huge footprints, they trailed them back to a huge cave, where they discovered the old man's bones and skull - all that remained after the giant had eaten him. They also found the skeletons of some of its earlier human victims. So, vowing to avenge their dead Pueblo kinfolk, they decided to smoke the monster out of its cave and kill it. When the enraged giant finally emerged, coughing loudly, they shot many arrows at it, but their weapons did not seem to harm it, and it ran away. According to their description, the giant had big hands, feet, head, and mouth, very muscular arms, and a burly body covered in long hair. Eventually, after being chased by the Pueblos across the Lucero River, the giant was struck by lightning, and after retreating, fatally wounded, inside another cave, it died. It is interesting to note not only that the giant's description compares closely with that of today's bigfoot but also that many present-day eyewitness reports of bigfoot encounters claim that the creature does not seem to be harmed by weapons, not even by bullets. Intriguingly, according to an early Taos legend, as long ago as the 12th Century a tribe of Pueblos travelled southwards to the Rio Colorado's canyon, about 10 miles from Taos itself. Here they built a stone village, but were attacked by giants, forcing them to flee south. The Kwakiutl Indians of British Columbia, Canada, also speak of forest-inhabiting giants with a taste for human flesh. In one such tale, a group of small children met a huge hairy man-beast, far taller than any human, and also readily distinguished from humans by its face, whose skin was rough and whose eyes were sunk deep in its face. This is a common, recurrent trait in Amerindian stories of hairy giants - and is one that just so happens to be a characteristic consistently occurring in modern-day descriptions of the bigfoot too. This frightening being soon caught the helpless youngsters and carried them away in a large basket on its back, but one boy managed to escape from the basket without being seen by the giant and ran back to his village to alert the adults. Swiftly forming a hunting party, the village's men followed the trail left behind by the giant, as pointed out to them by the boy, and eventually they found themselves outside a large cave. Peering inside, they could see the giant and his wife, tying up the children in front of a large fire. In this particular folktale, the men and the giants spoke the same language, conveniently enabling them to ask the giant what he intended to do with their children. Not surprisingly, they were horrified when he confirmed that he and his wife planned to smoke them over the fire, then eat them for dinner. Happily, however, fate lent a helping hand, when the giant unexpectedly confessed to the men that he was curious as to why their faces were smoother and their eyes more attractive than his. Thinking quickly, the men promised him that if he released the children, they would make his skin and eyes like theirs. The vain giant agreed, so once the children were safely out of harm's way, the men told him to fetch a large flat rock and a sharp pointed rock, and they would begin his beautifying treatment immediately. When they had been given the two rocks, the men instructed the giant to lie on the ground, use the flat rock as a pillow to support his head, then close his eyes tightly, and keep them closed for the next four days, after which the treatment would be complete. This he did, but once his eyes were closed, the men hit him between his eyes with the sharp rock, slaying him instantly. When his giantess wife came to see what was happening, the men coolly informed her that he needed to lie there for four days, undisturbed, in order for the treatment to work. Little suspecting the truth, she allowed the men to leave the cave, which they did with all speed, until it was soon lost to sight in the far distance. Needless to say, such tales as these could easily be dismissed as entirely mythical, with no basis whatsoever in reality. After all, stories of man-eating giants are commonplace in mythology worldwide. So too, however, are modern-day reports of hairy man-beasts. Is it possible that these creatures do indeed exist - relics of more primitive, larger primate species, such as Gigantopithecus, known from fossils but not thought to have survived to the present day - and have been transformed by vivid human imagination from shy, inoffensive beings into bloodthirsty cannibals? There is a notable precedent for this hypothesis. For centuries, travellers returning home to Europe from Africa recalled lurid native legends of huge, hairy, man-eating giants. Scientists, however, refused to believe such stories, until the existence of a certain species of extremely large, hairy, African primate was confirmed in 1847 - since when science has shown that it is really a placid vegetarian. Today, we call this once-discounted giant the gorilla - and tomorrow, we may finally become acquainted with another officially-discounted giant, the bigfoot. The narwhal or unicorn whale Monodon monoceros is certainly one of the world's strangest whales - a veritable sea monster. It earns its alternative name from its single extremely long, spiralled, ivory tusk (in reality a greatly enlarged left upper incisor tooth), which was once believed to be the horn of the unicorn, and was known as an alicorn. Usually, only the male produces a tusk, but occasionally a female will also do so. Moreover, as I mentioned in the unicorn chapter of Dr Shuker's Casebook: In Pursuit of Marvels and Mysteries (CFZ Press: Bideford, 2008), even more rarely a narwhal will develop a pair of these tusks. Such individuals are variously termed double-tusked, bidental, or bidentate, and although they are extremely rare, I have details of several examples on file. For example: in a Proceedings of the Zoological Society of London paper from 1871, J.W. Clark lists no fewer than eleven double-tusked skulls from exceptionally-endowed narwhals. These comprise four specimens in Copenhagen, and one each at the Museums of Hamburg (a female, apparently from Greenland), Christiania (now Oslo), Amsterdam, Weimar, Hull (specifically, the Museum of Fisheries and Shipping), Paris, and Cambridge. Others on record include a second Hull specimen (reported in 1937), a specimen at the U.S. National Museum, one at the Dundee Museum, and at least three at London's Natural History Museum (one of which is currently on public display there). The first of the London three was purchased by the museum in 1885 (and revealed that the spiral in both tusks twisted in the same direction, in contrast to the paired horns of spiralled-horned antelopes such as the kudu in which the horns' spirals twist in opposite directions); the second was purchased in 1917 for 10 guineas; and the third was presented to the museum in 1934 by a nephew of naturalist Frank Buckland, who in turn had received it from a Captain Gray of Peterhead. WOLVES OF THE WEIRD - WELCOME TO MY NEW BLOG, SHUKERNATURE! 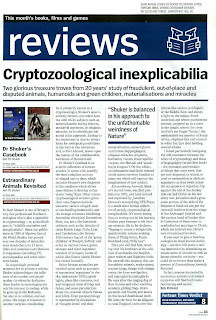 Welcome, cryptozoology fans, to ShukerNature! After long resisting the temptation to enter the frenzied if fascinating world of blogging, I've finally given in to the inevitable. So here, maintaining the unofficial CFZ theme of the week, is my contribution to the "Wolves of the Weird". My Italian correspondent Igor Festari recently brought the following intriguing snippet to my attention. In Guide des Mammifères d'Europe, d'Afrique du Nord et du Moyen-Orient by Aulagnier et al (Delachaux & Niestle, 2008), a tantalising paragraph states that certain authors consider the big jackals of eastern Egypt not to be jackals at all but, instead, deem them to be little wolves (presently unknown west of the Sinai peninsula), though beware misidentification with free-roaming domestic dogs. Could these enigmatic canids represent a new wolf subspecies, or unknown population, or range extension? A similar situation once existed in Hungary. As documented in my book Extraordinary Animals Revisited (CFZ Press, 2007), this eastern European country was formerly home to a mysterious wild canid known as the reedwolf. Some authors believed it to be a small but genuine lupine form, others opined that it was a jackal. Sadly, it now seems to be extinct, but museum specimens exist, and even today a degree of controversy remains in relation to its taxonomic status. AN IDENTITY CRISIS FOR ANUBIS? One of the most familiar members of ancient Egypt’s pantheon of gods is Anubis, the deity of mummification. 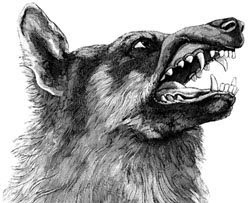 For untold ages, Anubis has always been referred to as jackal-headed, on account of being portrayed with a canine head traditionally identified as that of Egypt’s jackal. However, this tradition has now come to a very abrupt end, thanks to the remarkable discovery that Egypt’s jackal is nothing of the sort. Genetic research by a team of researchers led by Dr Eli Rueness has revealed that it is in fact a hitherto-unrecognised form of the grey wolf Canis lupus. As such, it is, therefore, the only form of wolf native to the continent of Africa, has been duly dubbed the African wolf, and is most closely related to the Himalayan wolf. This in turn means that from now on, Anubis should be referred to not as jackal-headed but as wolf-headed. In July 2015, Dr Klaus-Peter Koepfli and a team of co-researchers verified in a Current Biology paper that the Egyptian jackal was definitely a wolf, having analysed "extensive genomic data including mitochondrial genome sequences, sequences from 20 autosomal loci (17 introns and 3 exon segments), microsatellite loci, X- and Y-linked zinc-finger protein gene (ZFX and ZFY) sequences, and whole-genome nuclear sequences in African and Eurasian golden jackals and gray wolves". Their results revealed that the African wolf had split from the golden jackal more than 1 million years ago, and therefore deserved formal recognition as a separate species in its own right, for which they have proposed the official scientific binomial name Canis anthus ('golden dog' or 'golden wolf').